So our vegan challenge is finished, and sorry for not posting more about it. We're still unpacking, a month later. We're been working, and driving, and visiting my family, and digging a garden. Turns out I have a problem buying plants - I can't help myself. Pictures to come, once we've finished planting. 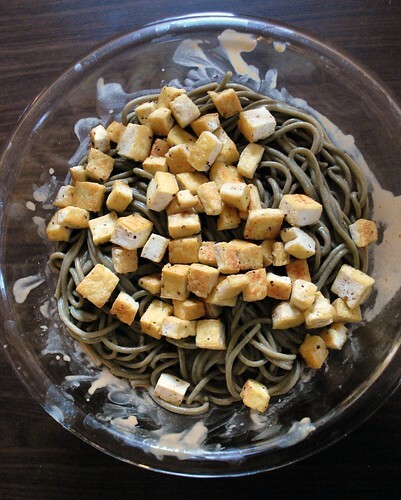 One of my favorite vegan meals we had was peanut noodles with tofu. I've been buying fresh tofu, made locally. I forget the brand. In the picture I used spinach Tinkyada spaghetti, but it's just as good with regular spaghetti. Or even rice noodles, if it's too hot to cook for too long. Heat the oil in a large pan, and cook the tofu. I like to cook it a long time on each side, so it gets crispy on each side, then shake the pan around. Sometimes I get crazy and sprinkle it with garlic powder and pepper. In the blender, combine everything else (peanut butter to pepper flakes) and taste. You might want to add a little more peanut butter or honey, or some chili oil. 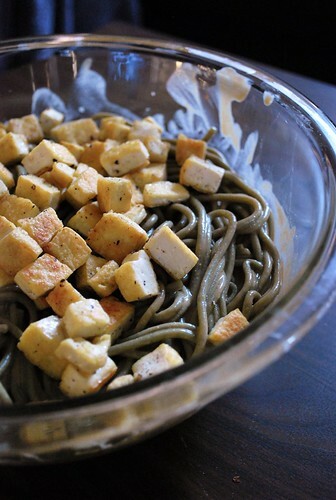 Toss with the noodle right before you serve it, then top with tofu. This is good warm, or cold for lunch the next day. I am a sucker for anything with peanut sauce. Sounds delicious! Yes - I want to see photos of this garden! This is a fab recipe! My daughter just said she wants to try and eat more tofu and this was perfect! We accompanied it with homemade gluten free french bread made with my all purpose gluten free flour with millet. Awesome! Thank you!